Chris is passionate about all types of analysis, both fundamental and technical, and believes that a combination of the two yields the best performance returns. Chris is highly qualified with undergraduate degrees in law and economics, an MBA, a Graduate Diploma in Applied Finance, a Diploma in Technical Analysis (ATAA) and a Certified Financial Technician (IFTA) accreditation. 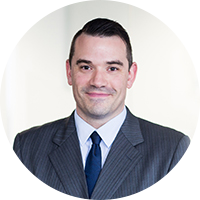 Chris is proficient in technical analysis, with strong analytical and quantitative skills and a deep understanding of economic/financial theory and the investment process. Chris is a regular market commentator, appearing frequently on Your Money and being quoted in the Financial Review, The Age and Sydney Morning Herald, Reuters and The Australian. He is also a regular contributor to the Herald-Sun/Courier Mail Share Tips column. Chris has been recognised as one of the top stock pickers in the country in recent years, finishing 3rd in 2015, 2nd in 2016, and 1st in 2018, in the Stockpicker of the Year Award, as judged by the Australian Stockbrokers Foundation.